There’s not a soul out there that thought the 2017 Brewers would be as good as the 2017 Cubs. There’s not a soul out there that thinks the 2017 Brewers will be as good as the 2017 Cubs. And yet, the 2017 Brewers have been as good as the 2017 Cubs, at least by wins and losses, which are ultimately the only numbers that matter. The Cubs have three more wins than defeats. The Brewers can say the same of themselves. The Cubs have been billed as an active dynasty. The Brewers have been rebuilding. I’ll be damned. We’ll all be damned. One key to understanding what’s going on: Before the start of the season, we ran our annual positional power rankings, and the Brewers rotation slotted in at 25th place. By actual WAR to this point, that same Brewers rotation ranks in seventh place. A certain amount of credit ought to go to Chase Anderson, who’s exceeding expectations. But he’s not exceeding them quite as much as Jimmy Nelson. In Nelson, it looks like the Brewers might have an ace. Starting pitchers, minimum 40 innings each year. Starting pitchers, minimum 100 lefties faced each year. Since Nelson reached the majors, lefties have hit him to the tune of a .340 wOBA, striking out less than a fifth of the time. But for this season alone, that wOBA has dropped to a woeful .259, with strikeouts nearly a third of the time. Nelson’s a righty, yet all of a sudden, he’s changed into a guy who might have a reverse platoon split. No one ever would’ve expected that, and we can at least offer one simple explanation for Nelson’s overall improvement: strikes. He’s just throwing a whole bunch of strikes. Nelson right now has baseball’s highest zone rate. His zone rates have never been bad, but now he’s pitching aggressively, pitching with confidence. And, given his numbers, why wouldn’t he? Nelson’s showing the best command and control of his life, and since he gets his heater into the mid-90s, he’s certainly not hurting for stuff. He’s locating it, and it turns out locating better makes talented pitchers better. Who knew? That’s 2016 on the left, and 2017 on the right. It’s just one more minor change, but 2017 Nelson isn’t throwing so much across his body, because he’s stepping more directly toward the target. Look at the visible area between his feet, even just in two dimensions. There was a gap, and now there’s hardly anything. Some pitchers are more comfortable throwing across their bodies, and there’s no such thing as a universally applicable mechanical improvement, but what we have here is a pitcher who has clearly improved. All of these tweaks together have turned Nelson into something he’s never before been. 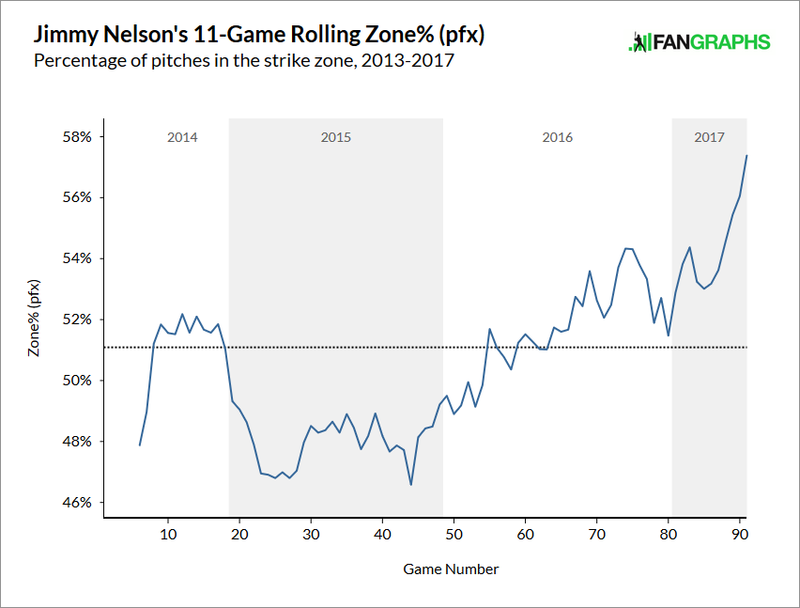 You never know how much of a player’s gains he’ll be able to hang onto, as the league starts to come around, but I’m greatly encouraged by Nelson’s newfound ability to throw strike after strike. And while I realize that Nelson wasn’t very good in last year’s second half, as he began to adjust, sometimes adjustments take time to feel normal. Sometimes little adjustments continue until something or everything clicks. Nelson throws hard and he’s getting ahead, and with lefties in particular, he’s turned a weakness into a strength. James Paxton altered his delivery and figured it out in his age-27 season. 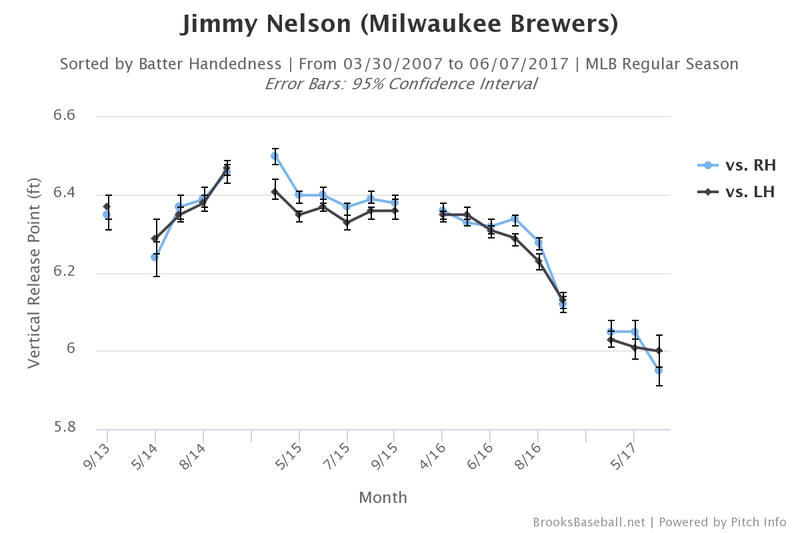 It seems like Jimmy Nelson has altered his delivery and figured it out in his age-28 season. The Brewers, probably, won’t be sitting in first place in their division much longer. Yet this year was and has always been about player development. There’s a convincing argument to be made that Jimmy Nelson has developed. We hoped you liked reading The Brewers Might Have an Actual Ace by Jeff Sullivan! One big thing that seems to be missing before he earns the “ace” label (besides sustaining this performance over a longer period) is the ability to go late in games. The only pitcher in his vicinity on the WAR leaderboard who averages less than his ~5.85 IP/Start is McCullers, and obviously Milwaukee doesn’t have anything remotely resembling Houston’s bullpen situation. 7 and 8 innings in his last two starts offers some hope.